Yes! We're having a contest. And a livestream! Don't know what Ma.K is? Check this out. Theme: non-Ma.K things in Ma.K style. For example, a Ma.K firetruck or mobile crane. A Ma.K house or a Ma.K lawnmower. A Ma.K smartphone or motorcycle. Essentially, build something in Ma.K style that no one has ever built in that style before. Hardsuits and starfighters are great; but they've been done. Let's see something new! 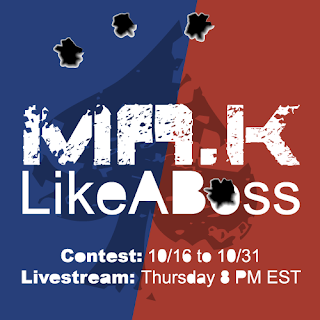 As a promotional event for the contest, Jacob (4est Feller) and I (John (Five Fives)) will be hosting a live building event via Google+ and YouTube. The livestream starts today (Thursday October 16th) at 8 PM EST, and should last about two hours. We'll be building Maschinen Krieger, and the two models that we build will be the first and second place prizes for the contest! We'll be answering questions, taking suggestions and generally talking through our process as we build. I'm looking forward to it, and I hope everyone stops by! Here are the links to where the livestream will be on Google+ and YouTube. If you want to ask questions it looks like Google+ will work better for that. See you there!